It’s been almost ten months or so since George Pérez announced his exclusivity with Boom Studios. And in that time we’ve learned, if you follow him on Facebook (as I do since he is my all-time favorite comicbook artist), that he’s been doing theatre, finishing up extensive eye surgery and working on a new creator owned series for Boom due out in the Fall. So there hasn’t been much in the way of published work other than variant covers and such. And this is one of them. 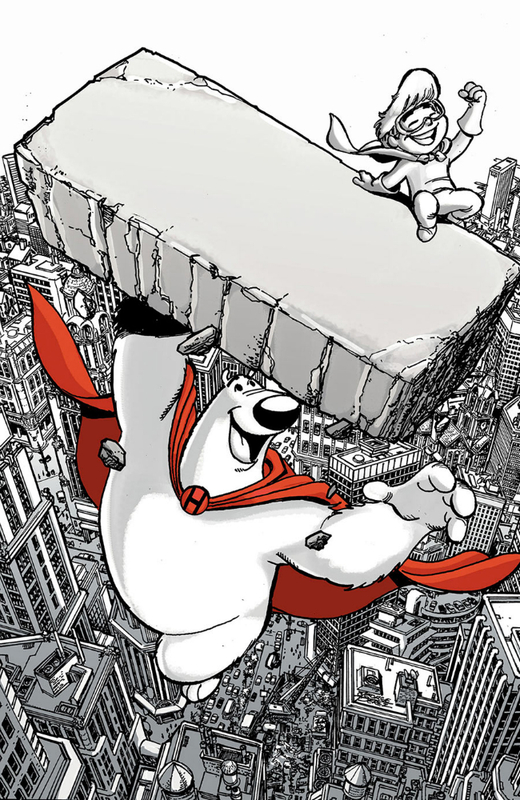 The first issue of Mike Kunkel’s new Herobear and the Kid: Saving Time series hits this week and with it a Pérez variant complete with classic elements unique to his art: an overhead shot of a cityscape and Pérez rubble! Sweet sweet stuff. Interesting. When Perez came back to Marvel, the first thing we saw from him was that Crisis homage cover for Mighty Mouse, wasn’t it? Speaking of which, did you order that special, gold-ink signed edition of Infinity Gauntlet #1? Ten bucks, but I had to have that.